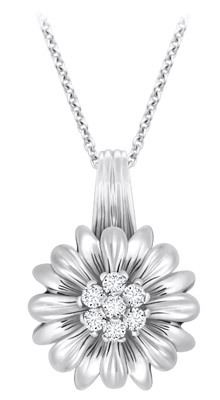 This beautiful 14K White Gold large flower pendant has seven 2.5mm cubic zirconias set in the center. Pendant comes on an 18 inch, 1.1 mm white gold cable chain. Part of our new designer line, this pendant has a matching ring and earrings.